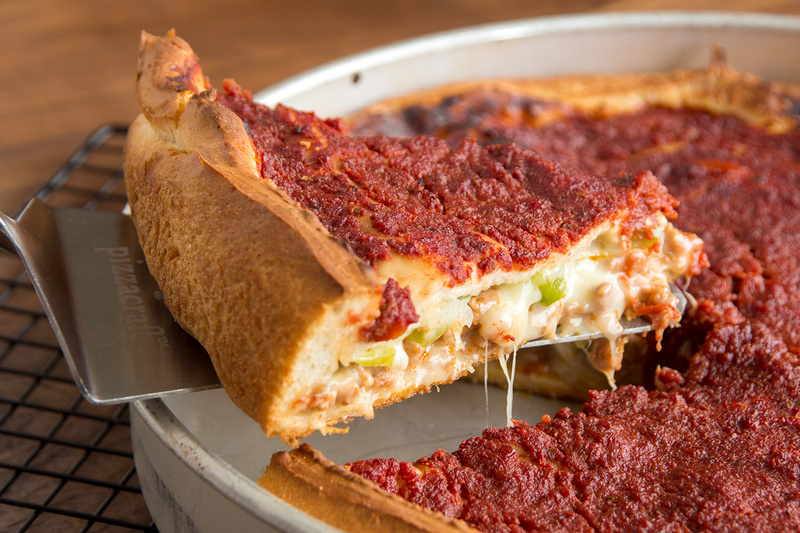 Try this delicious Chicago Style Pizza for your next pizza party! Spray counter lightly with cooking spray. Combine 12 rolls and roll into a 16 inch circle. Combine remaining 10 rolls and roll into a 14 inch circle. Cover both circles with plastic wrap and let rest. Combine crushed tomatoes with Italian seasoning, sugar, salt and pepper. Mix well and set aside. Remove wrap from dough circles. Place 16 inch dough circle in a sprayed 12 inch deep dish pizza pan to cover bottom and sides and overlap edge of pan. Sprinkle with 1/2 cup mozzarella cheese. Top with cooked sausage, onions, mushrooms and green peppers. Sprinkle with remaining 2 1/2 cups mozzarella cheese. Place 14 inch dough circle over the top of fillings, overlapping the edge of pan. Cut a vent in the middle and trim off overlapping dough around sides of pan. Pour sauce over top and spread evenly. Bake at 425 degrees F 25-35 minutes. I made this yesterday as written and it was awesome. From Chicago and it was as good, if not better than the big name place out here.